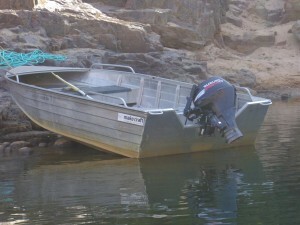 We’ve had a great tour of the Kimberley region of Western Australia with AAT Kings. Our guide, Nellie, and driver, Cam, made sure our trip was the best it could be (in spite of those early mornings they inflicted on us so we could get to the next magnificent attraction). Cruises up tropical rivers with crocodiles sunning themselves on the banks, feeding the fish in the Chamberlain Gorge, flying into the Bungle Bungles, drooling over pink diamonds at the Argyle Diamond Mine, visiting the War Cemetery at Adelaide River. Then there was swimming in the Katherine River at Katherine Gorge. The cruise guide assured us that they’d checked to make sure the area we swam in was free of crocs but only five of us took the chance. 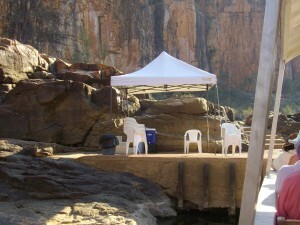 Beautiful cool water – bliss after the heat and walking from one part of the gorge to the next. I wondered if one of the crocs was partial to propellers. The resting place for those too tired to walk from one part of the gorge to the next. It’s been many months since there’s been rain in the Top End and it’s very dry. The cruise boat could only go so far up the river and then we had to walk to the next level where another boat waited but that could only go a short distance as well. Guess we’ll have to come back after The Wet to see the Gorge at its full glory. 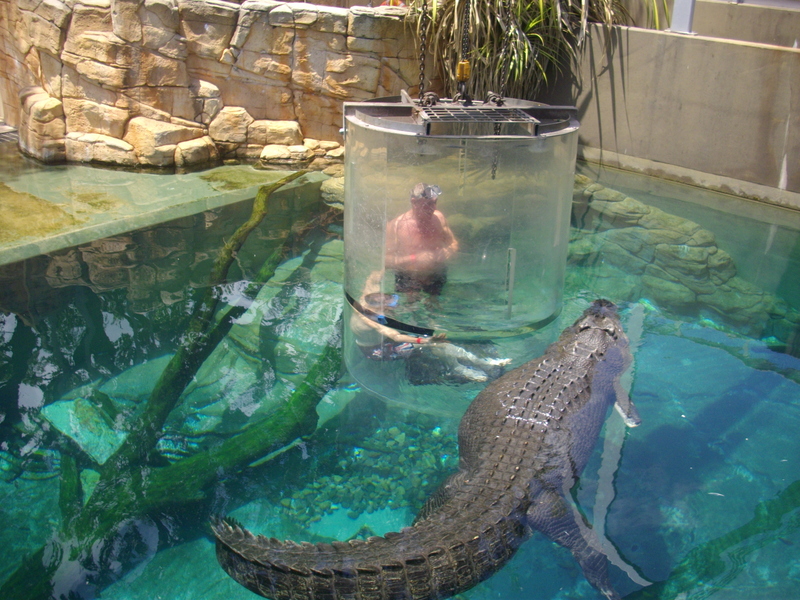 Rob and Tom (we’d met Tom and his sister Tanya on the coach tour) decided they wanted to swim with a ‘saltie’ so shared a perspex cage at Crocosaurus Cove with Chopper sizing them up for dinner. Rob and Tom swimming with Chopper, the 5.1m croc so named because he was missing one front limb and the ‘hand’ of the other limb. Didn’t stop him moving with lightning speed when he went after the meat the handlers fed him. We were told Darwin’s The BookShop had closed down, but were delighted to discover it had only moved and found it in its new location of Shop 1-30 Smith Street Mall. Gotta love those independent book stores – they are fighters and deserve to survive. And thrive. I took some copies of Fatal Flaw with me to donate to the Darwin Library, but ended up being directed to the State Library instead of the public Library. Turned out to be a lucky chance as I met lovely Hayley who had not only read my books but was a fan. It was such a wonderful surprise. The biggest thrill for writers is discovering readers who love our books. It’s such a great feeling to know that readers enjoy them. Thanks, Hayley, you made my day.